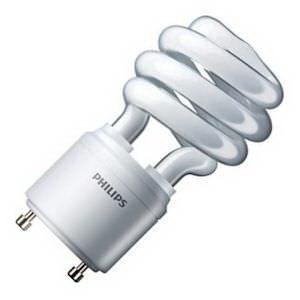 Philips Lighting Energysaver twist/spiral 13-Watt spiral GU24 base compact fluorescent lamp offers 900 initial Lumens for crisp light output. It has color rendering index of 82. Lamp with 4100K color temperature rating radiates cool white light to the surrounding. It measures 3.6-Inch x 1.75-Inch Dia. Lamp has average life of 10000 hours.